Sat., Feb. 3, 2018, 11:36 p.m.
SCOTTSDALE, Ariz. – Rickie Fowler birdied the last three holes to take the lead in the Waste Management Phoenix Open, overcoming a sluggish start in front of the largest crowd in golf history. Justin Thomas went the other way, wasting a brilliant opening run with another late meltdown. Fowler shot a 4-under 67 on Saturday to reach 14-under 199 with a round left at TPC Scottsdale’s Stadium Course, the fan-friendly layout packed with an estimated 216,818 fans on an 80-degree afternoon. The fourth-ranked Thomas, the PGA Tour player of the year after winning five times last season, birdied the first six holes to take the lead. But instead of making a run at his second sub-60 round in a little over a year, Thomas had to fight for an even-par 71 that left him eight shots back. He dropped six strokes in a three-hole stretch, making a bogey on the par-4 14th, a triple bogey on the par-5 15th and a double bogey on the rowdy par-3 16th. On Thursday in the first round, he had a double bogey on 16 and a bogey on 17. Thomas left the course without speaking to the media. Former Arizona State players Jon Rahm and Chez Reavie were a stroke back along with Bryson DeChambeau. Phil Mickelson was two shots behind, another former Sun Devils star riding the crowd support. The crowd pushed the week total to 654,906, just short of the record of 655,434 set last year. 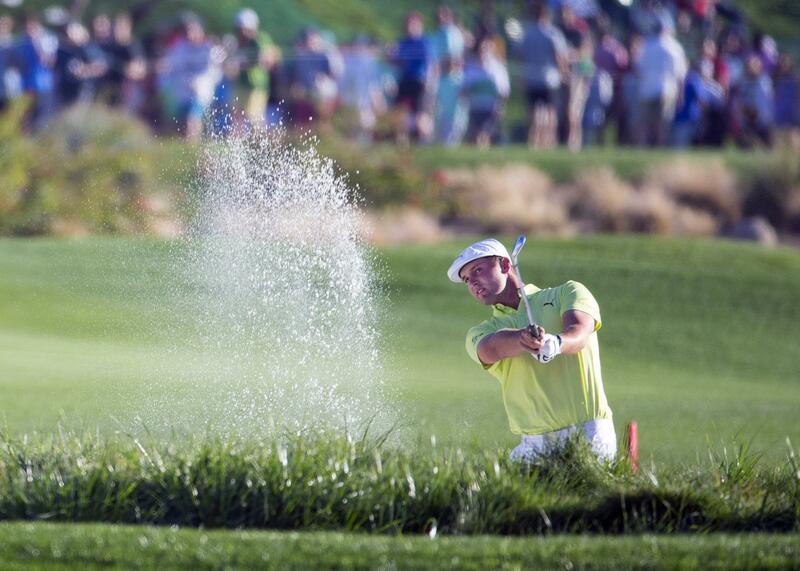 Fowler is trying to finally win in the desert. He finished a shot behind Hunter Mahan in 2010, lost to Hideki Matsuyama on the fourth extra hole in 2016, and tied for fourth last year. The four-time tour winner began his birdie run with a 17-footer on 16 and connected from 9 feet on the par-4 17th and 18th holes. He also birdied 13 after playing the first 12 in even par with a birdie and a bogey. Rahm had a 65, playing alongside Mickelson and Schauffele for the third straight day. The 23-year-old Spaniard had five birdies in a seven-hole stretch on the back nine. He won two weeks ago in the California desert at La Quinta to jump to No. 2 in the world. Reavie birdied the final two holes for a 67. DeChambeau shot 68. He lost the lead with a bogey on 17 after driving into the water. Mickelson birdied the final two holes for a 66. He’s making his record-tying 29th start in the event he won in 1996, 2005 and 2013. Xander Schauffele and Daniel Berger also were 12 under. Schauffele shot 66, and Berger had a 68. Fowler is wearing a pin on his hat with a picture of Griffin Connell, the area boy he befriended at the event who died last week at age 7. Griffin was born with a rare airway disorder. “We actually had a ball go a little left on 11 today and we joked about it that Griffin took one in the chest and kept it out for us,” Fowler said. Published: Feb. 3, 2018, 11:36 p.m.